Foothills, montane, subalpine. Open rocky areas. Summer, fall. Shoulder of Mount Linnaeus, Abajo Mountains, Utah, September 7, 2005. These delicate Mints grow straight and tall on hairy, stiff, somewhat woody stems. Flowers are in open clusters. 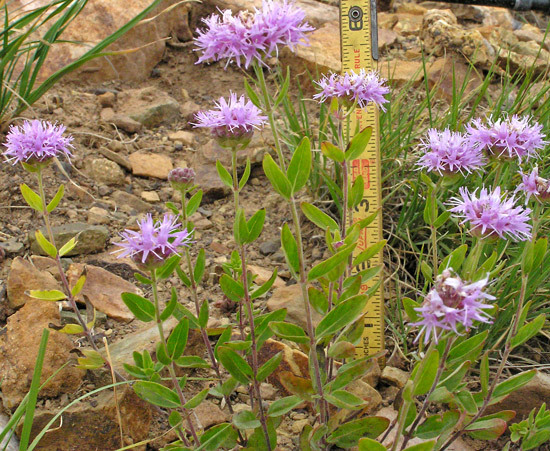 Monardella odoratissima likes open rocky areas, both wet and dry, from low to high altitudes. As pictured here, they are at about 10,500 feet on a dry, rocky, south-western exposure. 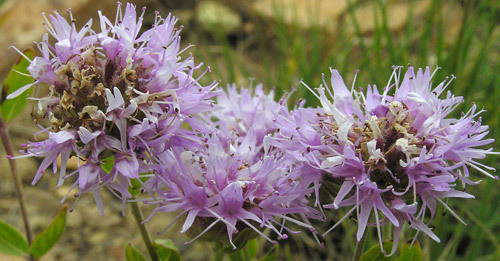 There are a number of subspecies of Monardella odoratissima found through many of the western states; our species is classified as Monardella odoratissima subspecies glauca. 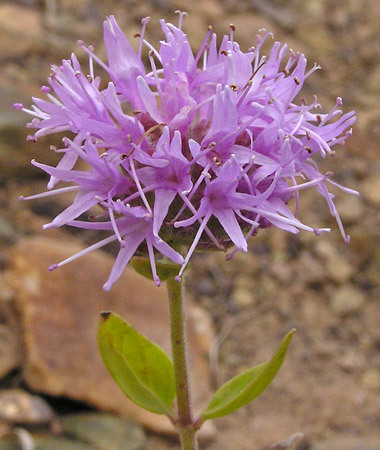 "Monardella" means "little Monarda"; Monarda is another genus of the Mint Family. "Glauca" is Greek for "blue-gray". David Douglas, of Douglas Fir fame, collected a specimen of this plant in the late 1820s near Kettle Falls on the Columbia River and it was named by Bentham in 1834. 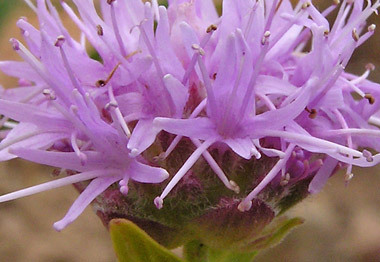 Monardella odoratissima has many common names. Flowers and foliage are very aromatic, so much so that some people have a quick allergic reaction to the strong smell. If you walk through a patch of the plants (and they often do grow in large patches), keep your handkerchief handy. Just above the two green leaves at the base of the flower head you can see the purple tinged bracts which are ciliate, i.e., they are fringed on their margins with fine hairs. When the bottom right bract is magnified, the hairs show as short white streaks.